Being able to identify letters and make letter-sound associations is a big part of Margaret's school day right now. I always try to have at least two ABC related activities for her to work on in her workboxes. I obtained some nice magnetic letters and Margaret must place them in ABC order. 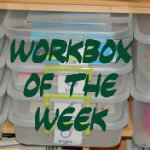 You could even write out the letters on index cards for this activity. I like the wooden letters because it helps reinforce the shape of the letter. I usually have her group them by color so that if she is struggling I can say, "Look in the yellow pile." This also reinforces classification and color identification.